I was stunned. As it turned out, when these two women, Feronika Manderos and Rani Lambainang, were third and fourth graders (in 2001), they participated in our very first educational outreach program at the local elementary school in Batu Putih. They remembered details of the outreach program, in particular the conservation art contest we held. In fact, Feronika received third place in the contest for her drawing of a female, red-knobbed hornbill. They told me how much they wanted to win the first-place prize as kids: a Woodland Park Zoo t-shirt! Knowing the mark this program left on these young women and how they have continued their commitment to conservation into adulthood reaffirmed for me the importance of the education outreach we do. Even more inspiring, these young women will continue to live and spread these conservation lessons as they pursue their future endeavors, Feronika hoping to become a local tourist guide at Tangkoko and Rani working to obtain her teaching certificate to teach elementary school. Global Field Training in Conservation Biology is one of 37 conservation programs in 50 countries worldwide supported by Woodland Park Zoo. Through this WPZ Partner for Wildlife, the field training program gives these young leaders the hands-on skills needed to evaluate threats to the environment and plan successful conservation strategies. As part of the field training program, participants also conduct community outreach and education programs for children from local schools, most of whom receive little beyond the most basic educational offerings. Learn more about Woodland Park Zoo’s conservation programs and how you can help. Photos provided by Global Field Training in Conservation Biology. Lions sleep. A lot. But when not sleeping, their instinct is to stalk and hunt prey. To nurture those instincts and add some excitement to our lion exhibit—both for the lions and for visitors—our keepers recently experimented with the addition of an enrichment lure line. 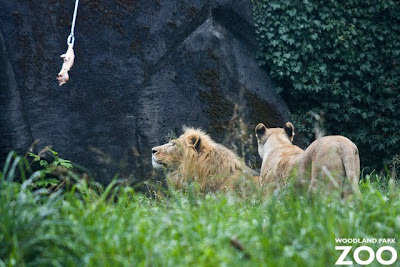 The lure line is basically a pully system stretching across the exhibit that allows the keepers to whiz a piece of meat or other tempting treat through the air, enticing the lions’ instincts and springing them into hunting action. We did the first test of the lure line last week and had surprising results. Keepers expected Kalisa, our female lion, to show the most interest, but it was in fact Hubert, our male, who had the biggest reaction. As the line whizzed past the pair, Kalisa cautiously observed, following its movement with her head. Hubert was the first to approach. Swinging with his paws, he got the chicken into the grip of his claws and mouth and ripped it off the line. 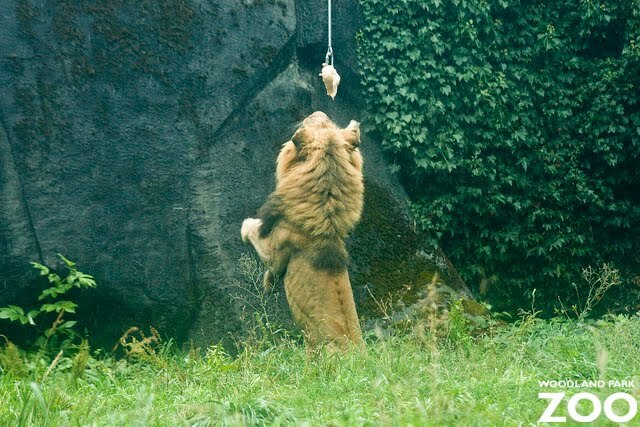 The second pass of the line was also taken down by Hubert, but he did share his snack with Kalisa. The line is a dynamic new form of behavioral enrichment for these lions that can add infinite variety as we change what snacks, scents and items we attach and send into the exhibit. 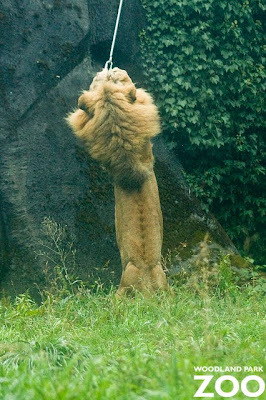 But, like all enrichment, it’s most meaningful to the lions when it isn’t predictable. So if on your next visit you happen to see the lure line in action, you’ll be as excited as the lions are to catch such a special treat. Photos by Rachel Gray/Woodland Park Zoo. Hi all you zoo fans! Come to the Third Annual Dine Out for Animals which is happening Sunday, October 3rd from 2:00 p.m. - 7:00 p.m. We're going to have a great time at Elemental and Elemental Next Door in Wallingford, thanks to Laurie and Phred who are donating their space again. Last year, we raised $5,000 for gorilla animal care and habitats at Woodland Park Zoo. This year, Dine Out will benefit even more animals: the zoo's gorillas plus also the turtles in the Day Exhibit, the Northern Trail grizzly bears, and the wildlife impacted by the oil spill in the Gulf. 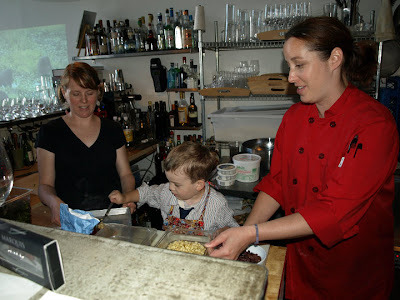 Why do I organize Dine Out every year? Since I was two years old, I've been really passionate about wild animals and saving them. I learned the letters of the alphabet by the names of the animals ("J" is for jaguar), and everyday I post an "animal of the day" on the Dine Out for Animals Facebook page. Everyone who checks my page can learn about wild animals and how to help them! If you come to Dine Out, you will feel really, really good about helping to save animals. You will have a great time, great food, a fun community to hang out with and new friends to make. I helped pick the menu—it's all vegetarian, of course, and really, really good, including a "make-your-own" scrumptious pizza. Many cool auction items are being donated by the zoo, local painters and jewelry artists, a Wild Ginger gift card and much more. So, everybody you see around town, tell them to come to Dine Out for Animals III! Tell them to bring all their friends! Zoo wins best exhibit "Oscar"
For the fifth time in our history, Woodland Park Zoo has been honored with an Exhibit Achievement Award by the Association of Zoos & Aquariums (AZA) for our Humboldt penguin exhibit. The prestigious award, equivalent to an "Oscar" in the zoo and aquarium world, was presented this week at AZA's annual conference in Houston. In a rare move by AZA, the top award also went to a second institution, Oregon Zoo, for its Predators of the Serengeti. The achievement award is presented by AZA for outstanding dedication to conservation issues, construction of exhibit space and simulation of species natural habitats. 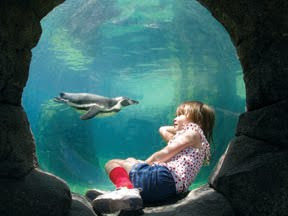 The state-of-the-art penguin exhibit, opened in May 2009, transports zoo-visitors to the rocky coastal peninsula of Punta San Juan, home to the largest breeding population of Humboldt penguins in Peru. There are many factors used to determine "best exhibit" status, but the many energy-efficient and "green" elements were key. The exhibit uses geothermal energy to heat and cool the water in the pool, and an innovative filtration system utilizing a constructed wetland to filter water, saves three million gallons of water and nearly 22,000 kilowatts of energy per year. It also avoids run-off into the city's storm drain system and pollution of Puget Sound. Everyone at the zoo would like to thank the public and private support provided by more than 550 donors, including the King County Park Levy, community fundraising campaigns, The Hugh and Jane Ferguson Foundation, Bill & Melinda Gates Foundation, Bank of America Charitable Foundation, Seattle City Light and Seattle Public Utilities. 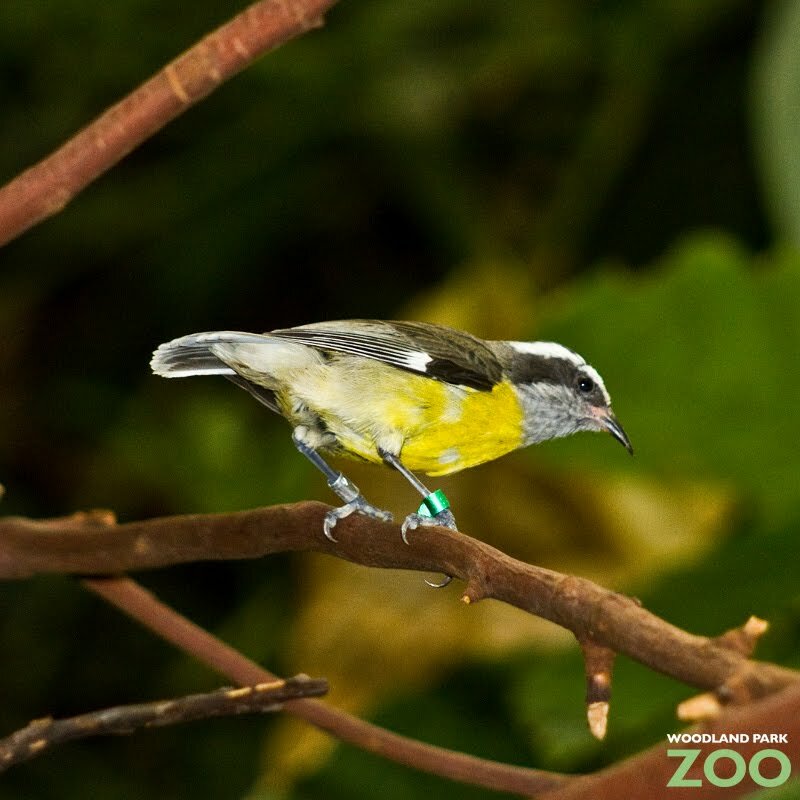 The newest species to join our Tropical Rain Forest dome, the bananaquit, is not rare in the wild, but this oddly named bird is certainly unique due to the fact that many scientists still disagree about exactly which taxonomic group it belongs. The bananaquit (Coereba flaveola) is a species of passerine bird (the order of birds which contains nearly half of all bird species ranging from warblers to crows and sparrows). It features a brilliant bright yellow breast with a dark gray-to-black top and horizontal white stripes above and below its dark eye. Its beak is slightly curved and awl-like. It is tentatively placed in the tanager family, but classified as incertae sedis by other authorities (such as the American Ornithologists' Union) as its affinity to other species is uncertain. This fancy Latin term basically means, "We don't know for sure." While its classification is debated, it is often placed in its own family, Coerebidae. Some birders describe it as a "miniature great kiskadee" and it is known for its tireless, high-pitched tsri song. 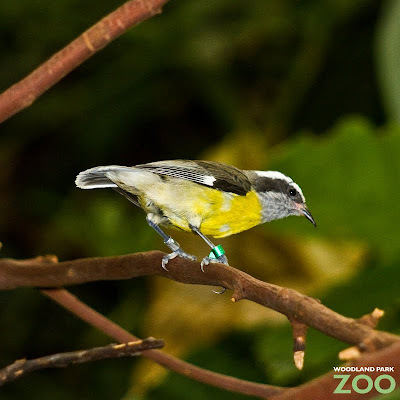 Bananaquit inhabit a wide range of open to semi-open habitats and are commonly seen in backyards, gardens, parks and other areas of human habitation in tropical South America, north to southern Mexico and the Caribbean. It is found throughout the West Indies, except Cuba. Birds from the Bahamas are rare visitors to Florida. More than two-thirds of the bananaquit diet consists of nectar which they obtain by piercing the calyx of flowers (the structure that protects the bloom before it appears). This hole will enlarge to allow other birds, such as hummingbirds, and insects to reach the nectar more easily. 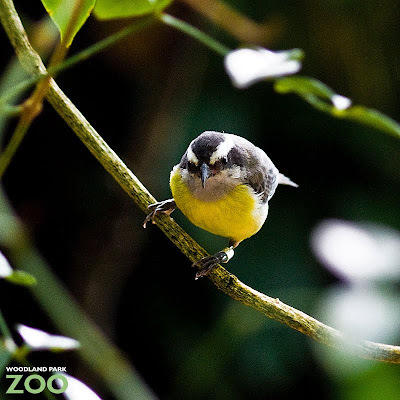 The newly arrived bananquits now reside in our Tropical Rain Forest building dome, mixing with other species including yellow-rumped cacique, white-tailed trogon, yellow-billed cardinal, blue-grey tanager, sunbittern, and crested oropendola. Recently I met Maggie B., who lives in Wisteria Park. For several weeks, she had a bear in her yard. 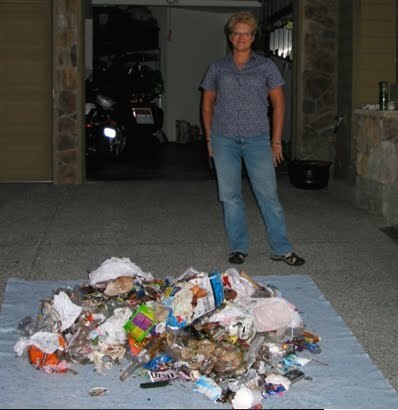 Maggie and her husband, as well as a few other neighbors, do appropriately store their garbage in garages until the morning of pick-up to deter bears. 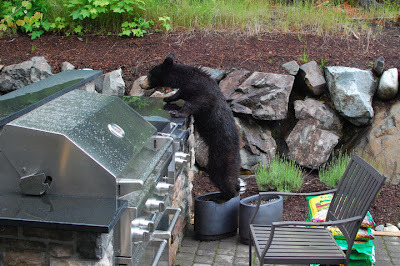 Unfortunately, many of her neighbors do not follow the same Bear Smart practices, which is why the bears continue to visit the neighborhood and her backyard. The bears were entering the Wisteria neighborhood through Maggie’s yard, as well as other neighbor’s yards. Once the bear smelled ripe garbage it wandered down the alley pulling out trash from garbage cans and brought the trash back into Maggie’s yard where it ripped open the bags to eat everything and anything it could find. 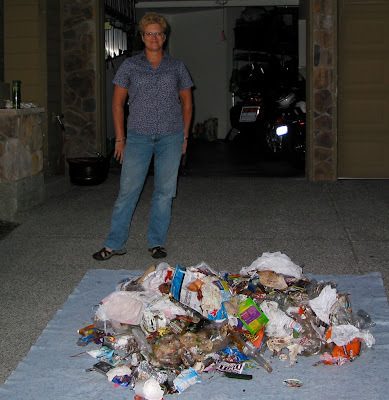 Over a four-day period Maggie collected three large bags of other people’s garbage from her yard and the greenbelt area adjacent to her home because she was concerned about the welfare of the bear and the safety of her community. Bears have an acute sense of smell and can smell garbage a mile away that is not properly stored. They also have an incredibly good memory. 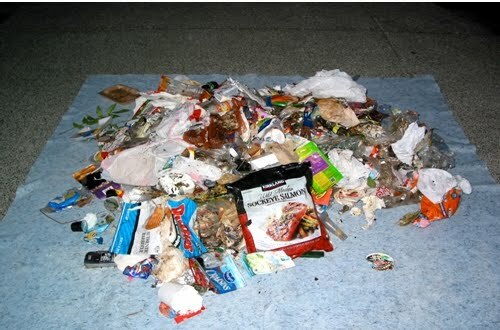 Once a bear becomes food-conditioned to high calorie foods, such as garbage, sunflower seeds, and even biodiesel, they will keep coming back for more. As part of our Grizzly Bear Outreach Project (GBOP) Bear Smart program, I provided timely assistance to Maggie and the community to address the immediate problem. As field representative for the Hwy 90 corridor, I worked with Maggie to reach out to her neighbors and provide information about how to be Bear Smart, from properly cleaning barbeques and storing garbage to reducing bear temptations by picking ripe fruit from trees. 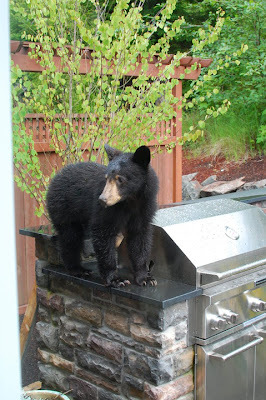 Together we went door to door providing information about these and other simple steps homeowners can take around their home to avoid attracting bears. When community members learned how food-conditioned bears become dangerous nuisances, they were willing to secure their trash. We also asked homeowners to sign a petition asking the Board of Directors of Issaquah Highlands to require community members to store garbage in garages until the morning of collection. Most members were willing and happy to sign. Unfortunately, while there has been less available garbage for the bears, they are continuing to return because there is still some unsecured trash in the neighborhood. GBOP will continue to work with community members to provide important Bear Smart practices and emphasize the importance of keeping bears wild and people safe. The Grizzly Bear Outreach Project (GBOP) is one of 37 Woodland Park Zoo conservation partners working to save wildlife and habitat in 50 countries around the world. GBOP’s Bear Smart program encourages communities and individuals to help reduce bear- human conflicts by helping local homeowners to identify and eliminate bear attractants. The more people understand bears, the more likely they are able to co-exist peacefully with them. Learn more about GBOP and other Woodland Park Zoo Partners for Wildlife and how you can help. Bear photos taken in Issaquah Highlands, June 2010, by Kate Hendrixson. Bottom photos taken in Issaquah Highlands, August 2010, by Cathy Macchio. I’m straining my eyes and craning my neck while sitting in a small boat speeding around a bend in the Kinabatangan River in Borneo. “There! There!” someone shouts and points to the nearby bank. It’s then that I catch my first glimpse of an elephant in the wild, a Borneo pygmy elephant calmly grazing on grass by the river. Eventually, we turn the corner and are able to see the entire herd of approximately 45 elephants. 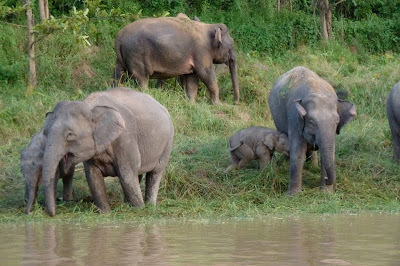 Most of the adult elephants are also ripping up and eating the long grass; some juveniles are wrestling with each other in the river; a few of the babies are nursing. Meanwhile, I am awestruck and amazed, tears streaming down my face, unable to believe that I’m witnessing this incredible natural phenomenon first-hand. Summer 2010 found me embarking on a Field Expedition to Borneo, an island in Southeast Asia considered to be a hotspot of ecological diversity, as part of my Global Field Program Master’s degree through Ohio’s Miami University. This Field Expedition was the first offered in partnership between Woodland Park Zoo and Project Dragonfly at Miami University. Project Dragonfly offers Field Expeditions courses for classroom and zoo/aquarium-based educators to experience inquiry-based science in dynamic field settings and to develop first-hand understanding of community-based conservation efforts in important wildlife areas around the world. In addition to inquiry-based learning and community-based conservation, this Field Expedition course focused on the ecology of Southeast Asian tropical forests, with particular attention to Borneo’s exceptionally rich primate community. 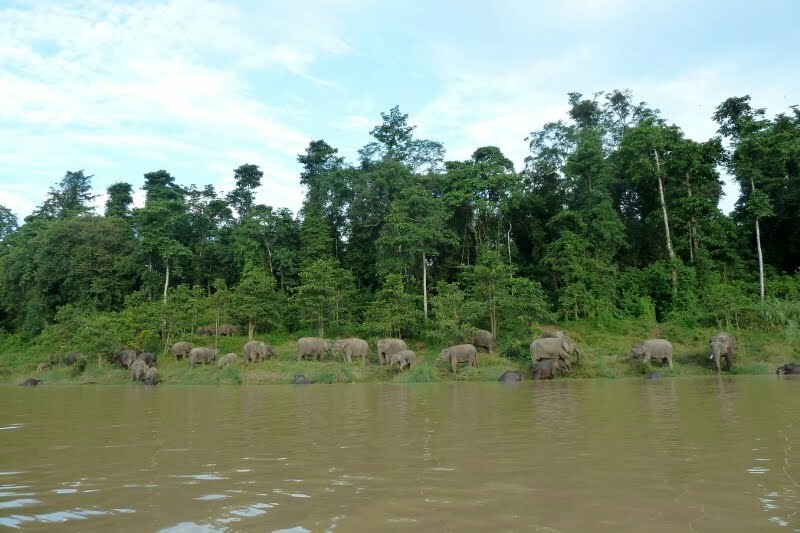 Our time was divided between the Danau Girang Field Centre, located in the middle of dense secondary tropical forest, and the village of Sukau, where Hutan Asian Elephant Conservation, a Woodland Park Zoo Partner for Wildlife, is based. At Danau Girang, we participated in boat rides in the morning and afternoon to observe the populations of primates that inhabit the forests around the Kinabatangan River, including orangutans, proboscis monkeys (found only on Borneo! ), long-tailed macaques, pig-tailed macaques and gibbons. In addition to primates, these boat rides also afforded excellent viewing of crocodiles (no swimming for us! ), hornbills (we saw six of the eight species found on Borneo! ), and the aforementioned elephants. When not cruising the river, we worked in groups on inquiry investigations, helped researchers with their small mammal trapping projects, and went on nocturnal frog walks (where we encountered the smallest frog in the world!). At Sukau, we worked with some amazing local people involved in Hutan, a Woodland Park Zoo-supported, community-based conservation project that works to conserve orangutans, elephants and tropical forests in a way that also benefits the local communities living with wildlife. With a research team, we surveyed orangutan nest transects, in which we locate and mark the daily nests orangutans make, then identify the tree the nest is made in, estimate its height and gauge the degradation of the nest, which determines how old it is. We also planted trees in a restoration site along the river, heard from the Elephant Conservation Unit on how they mitigate human-elephant conflict and learned about Fishermen for Conservation, in which fishermen use traps made of reused materials instead tree-damaging bark. We were welcomed warmly into the Sukau community. They taught us traditional games, we stayed with their families in homestays, we ate amazing Malay food and experienced traditional Warisan music and dance. It was a truly transformative experience; in fact, I’m already planning a return trip next year! For more information on next year’s Borneo Field Expedition, see the zoo’s website. 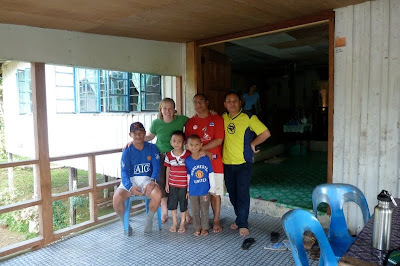 Even if you’re not earning graduate credit, you can still visit the community of Sukau through Red Ape Encounters, an ecotourism opportunity started by villagers involved with Hutan. Starting summer 2011, Woodland Park Zoo will have a new opportunity for educators in partnership with Project Dragonfly: the Advanced Inquiry Program, a new Master’s program for educators! Co-delivered by faculty at Miami University and Woodland Park Zoo professional education staff, the Advanced Inquiry Program combines graduate courses at the zoo with web-based learning communities that connect you to a broad network of educators and community leaders. Please join us for these exciting opportunities to get connected with animals and their habitats through community-based conservation and inquiry-based experiences at the zoo and in the field! Photos by Jenny Mears/Woodland Park Zoo.